A hard disk drive (HDD; also hard drive or hard disk) is a non-volatile, random access digital magnetic data storage device. It features rotating rigid platters on a motor-driven spindle within a protective enclosure. Data is magnetically read from and written to the platter by read/write heads that float on a film of air above the platters. Introduced by IBM in 1956, hard disk drives have decreased in cost and physical size over the years while dramatically increasing in capacity. 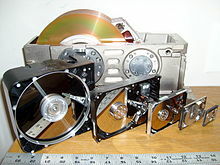 Hard disk drives have been the dominant device for secondary storage of data in general purpose computers since the early 1960s. They have maintained this position because advances in their recording density have kept pace with the requirements for secondary storage. Today's HDDs operate on high-speed serial interfaces; i.e., serial ATA (SATA) or serial attached SCSI (SAS). Hard disk drives were introduced in 1956 as data storage for an IBM real time transaction processing computer and were developed for use with general purpose mainframe and mini computers. As the 1980s began, hard disk drives were a rare and very expensive additional feature on personal computers (PCs); however by the late '80s, hard disk drives were standard on all but the cheapest PC. Most hard disk drives in the early 1980s were sold to PC end users as an add on subsystem, not under the drive manufacturer's name but by systems integrators such as the Corvus Disk System or the systems manufacturer such as the Apple ProFile. The IBM PC/XT in 1983 included an internal standard 10MB hard disk drive, and soon thereafter internal hard disk drives proliferated on personal computers. External hard disk drives remained popular for much longer on the Apple Macintosh. Every Mac made between 1986 and 1998 has a SCSI port on the back, making external expansion easy; also, "toaster" Compact Macs did not have easily accessible hard drive bays (or, in the case of the Mac Plus, any hard drive bay at all), so on those models, external SCSI disks were the only reasonable option. 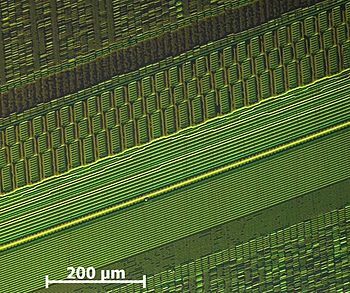 HDDs record data by magnetizing ferromagnetic material directionally. Sequential changes in the direction of magnetization represent patterns of binary data bits. The data are read from the disk by detecting the transitions in magnetization and decoding the originally written data. Different encoding schemes, such as modified frequency modulation, group code recording, run-length limited encoding, and others are used. 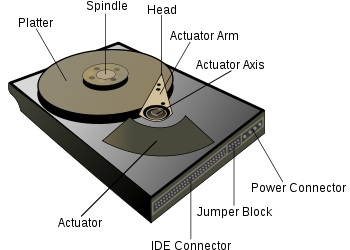 A typical HDD design consists of a spindle that holds flat circular disks, also called platters, which hold the recorded data. The platters are made from a non-magnetic material, usually aluminum alloy, glass, or ceramic, and are coated with a shallow layer of magnetic material typically 10–20 nm in depth, with an outer layer of carbon for protection. For reference, a standard piece of copy paper is 0.07–0.18 millimetre (70,000–180,000 nm). Recording of single magnetisations of bits on an hdd-platter (recording made visible using CMOS-MagView). The platters in contemporary HDDs are spun at speeds varying from 4200 rpm in energy-efficient portable devices, to 15,000 rpm for high performance servers. The first hard drives spun at 1200 rpm , and for many years, 3600 rpm was the norm. Information is written to, and read from a platter as it rotates past devices called read-and-write heads that operate very close (tens of nanometers in new drives) over the magnetic surface. The read-and-write head is used to detect and modify the magnetization of the material immediately under it. In modern drives there is one head for each magnetic platter surface on the spindle, mounted on a common arm. An actuator arm (or access arm) moves the heads on an arc (roughly radially) across the platters as they spin, allowing each head to access almost the entire surface of the platter as it spins. The arm is moved using a voice coil actuator or in some older designs a stepper motor. The magnetic surface of each platter is conceptually divided into many small sub-micrometer-sized magnetic regions referred to as magnetic domains. In older disk designs the regions were oriented horizontally and parallel to the disk surface, but beginning about 2005, the orientation was changed to perpendicular to allow for closer magnetic domain spacing. Due to the polycrystalline nature of the magnetic material each of these magnetic regions is composed of a few hundred magnetic grains. Magnetic grains are typically 10 nm in size and each form a single magnetic domain. Each magnetic region in total forms a magnetic dipole which generates a magnetic field. For reliable storage of data, the recording material needs to resist self-demagnetization, which occurs when the magnetic domains repel each other. Magnetic domains written too densely together to a weakly magnetizable material will degrade over time due to physical rotation of one or more domains to cancel out these forces. The domains rotate sideways to a halfway position that weakens the readability of the domain and relieves the magnetic stresses. Older hard disks used iron(III) oxide as the magnetic material, but current disks use a cobalt-based alloy. A write head magnetizes a region by generating a strong local magnetic field. Early HDDs used an electromagnet both to magnetize the region and to then read its magnetic field by using electromagnetic induction. Later versions of inductive heads included metal in Gap (MIG) heads and thin film heads. As data density increased, read heads using magnetoresistance (MR) came into use; the electrical resistance of the head changed according to the strength of the magnetism from the platter. Later development made use of spintronics; in these heads, the magnetoresistive effect was much greater than in earlier types, and was dubbed "giant" magnetoresistance (GMR). In today's heads, the read and write elements are separate, but in close proximity, on the head portion of an actuator arm. The read element is typically magneto-resistive while the write element is typically thin-film inductive. In modern drives, the small size of the magnetic regions creates the danger that their magnetic state might be lost because of thermal effects. To counter this, the platters are coated with two parallel magnetic layers, separated by a 3-atom layer of the non-magnetic element ruthenium, and the two layers are magnetized in opposite orientation, thus reinforcing each other. Another technology used to overcome thermal effects to allow greater recording densities is perpendicular recording, first shipped in 2005, and as of 2007 the technology was used in many HDDs. HDD with disks and motor hub removed exposing copper colored stator coils surrounding a bearing in the center of the spindle motor. Orange stripe along the side of the arm is thin printed-circuit cable, spindle bearing is in the center and the actuator is in the upper left. 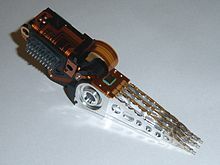 A typical hard disk drive has two electric motors; a disk motor that spins the disks and an actuator (motor) that positions the read/write head assembly across the spinning disks. The disk motor has an external rotor attached to the disks; the stator windings are fixed in place. Opposite the actuator at the end of the head support arm is the read-write head (near center in photo); thin printed-circuit cables connect the read-write heads to amplifier electronics mounted at the pivot of the actuator. 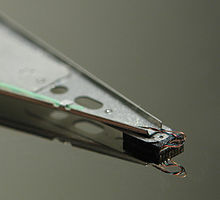 A flexible, somewhat U-shaped, ribbon cable, seen edge-on below and to the left of the actuator arm continues the connection to the controller board on the opposite side. The head support arm is very light, but also stiff; in modern drives, acceleration at the head reaches 550 g.
The silver-colored structure at the upper left of the first image is the top plate of the actuator, a permanent-magnet and moving coil motor that swings the heads to the desired position (it is shown removed in the second image). The plate supports a squat neodymium-iron-boron (NIB) high-flux magnet. Beneath this plate is the moving coil, often referred to as the voice coil by analogy to the coil in loudspeakers, which is attached to the actuator hub, and beneath that is a second NIB magnet, mounted on the bottom plate of the motor (some drives only have one magnet). The voice coil itself is shaped rather like an arrowhead, and made of doubly coated copper magnet wire. The inner layer is insulation, and the outer is thermoplastic, which bonds the coil together after it is wound on a form, making it self-supporting. The portions of the coil along the two sides of the arrowhead (which point to the actuator bearing center) interact with the magnetic field, developing a tangential force that rotates the actuator. Current flowing radially outward along one side of the arrowhead and radially inward on the other produces the tangential force. If the magnetic field were uniform, each side would generate opposing forces that would cancel each other out. Therefore the surface of the magnet is half N pole, half S pole, with the radial dividing line in the middle, causing the two sides of the coil to see opposite magnetic fields and produce forces that add instead of canceling. Currents along the top and bottom of the coil produce radial forces that do not rotate the head. Modern drives also make extensive use of Error Correcting Codes (ECCs), particularly Reed–Solomon error correction. These techniques store extra bits for each block of data that are determined by mathematical formulas. The extra bits allow many errors to be fixed. While these extra bits take up space on the hard drive, they allow higher recording densities to be employed, resulting in much larger storage capacity for user data. In 2009, in the newest drives, low-density parity-check codes (LDPC) are supplanting Reed-Solomon. LDPC codes enable performance close to the Shannon Limit and thus allow for the highest storage density available. Typical hard drives attempt to "remap" the data in a physical sector that is going bad to a spare physical sector—hopefully while the errors in that bad sector are still few enough that the ECC can recover the data without loss. The S.M.A.R.T. system counts the total number of errors in the entire hard drive fixed by ECC, and the total number of remappings, in an attempt to predict hard drive failure. 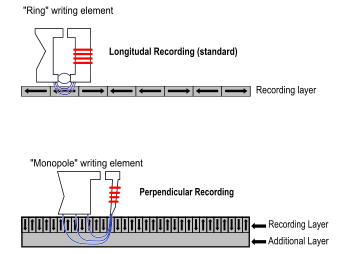 Due to bit-flipping errors and other issues, perpendicular recording densities may be supplanted by other magnetic recording technologies. Toshiba is promoting bit-patterned recording (BPR), while Xyratex are developing heat-assisted magnetic recording (HAMR). October 2011: TDK has developed a special laser that heats up a hard's disk's surface with a precision of a few dozen nanometers. TDK also used the new material in the magnetic head and redesigned its structure to expand the recording density. This new technology apparently makes it possible to store one terabyte on one platter and for the initial. TDK will produce HDD with 2 platters. 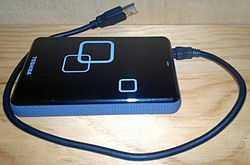 The capacity of an HDD may appear to the end user to be a different amount than the amount stated by a drive or system manufacturer due to amongst other things, different units of measuring capacity, capacity consumed in formatting the drive for use by an operating system and/or redundancy. The capacity of hard disk drives is given by manufacturers in megabytes (1 MB = 1,000,000 bytes), gigabytes (1 GB = 1,000,000,000 bytes) or terabytes (1 TB = 1,000,000,000,000 bytes). This numbering convention, where prefixes like mega- and giga- denote powers of 1000, is also used for data transmission rates and DVD capacities. However, the convention is different from that used by manufacturers of memory (RAM, ROM) and CDs, where prefixes like kilo- and mega- mean powers of 1024. The practice of using prefixes assigned to powers of 1000 within the hard drive and computer industries dates back to the early days of computing. By the 1970s million, mega and M were consistently being used in the powers of 1000 sense to describe HDD capacity. As HDD sizes grew the industry adopted the prefixes “G” for giga and “T” for tera denoting 1,000,000,000 and 1,000,000,000,000 bytes of HDD capacity respectively. Likewise, the practice of using prefixes assigned to powers of 1024 within the computer industry also traces its roots to the early days of computing By the early 1970s using the prefix “K” in a powers of 1024 sense to describe memory was common within the industry. As memory sizes grew the industry adopted the prefixes “M” for mega and “G” for giga denoting 1,048,576 and 1,073,741,824 bytes of memory respectively. Computers do not internally represent HDD or memory capacity in powers of 1024; reporting it in this manner is just a convention. Creating confusion, operating systems report HDD capacity in different ways. Most operating systems, including the Microsoft Windows operating systems use the powers of 1024 convention when reporting HDD capacity, thus an HDD offered by its manufacturer as a 1 TB drive is reported by these OSes as a 931 GB HDD. Apple's current OSes, beginning with Mac OS X 10.6 (“Snow Leopard”), use powers of 1000 when reporting HDD capacity, thereby avoiding any discrepancy between what it reports and what the manufacturer advertises. In the case of “mega-,” there is a nearly 5% difference between the powers of 1000 definition and the powers of 1024 definition. Furthermore, the difference is compounded by 2.4% with each incrementally larger prefix (gigabyte, terabyte, etc.) The discrepancy between the two conventions for measuring capacity was the subject of several class action suits against HDD manufacturers. The plaintiffs argued that the use of decimal measurements effectively misled consumers while the defendants denied any wrongdoing or liability, asserting that their marketing and advertising complied in all respects with the law and that no Class Member sustained any damages or injuries. In December 1998, an international standards organization attempted to address these dual definitions of the conventional prefixes by proposing unique binary prefixes and prefix symbols to denote multiples of 1024, such as “mebibyte (MiB)”, which exclusively denotes 220 or 1,048,576 bytes. In the over‑12 years that have since elapsed, the proposal has seen little adoption by the computer industry and the conventionally prefixed forms of “byte” continue to denote slightly different values depending on context. Modern HDDs, such as SAS and SATA drives, appear at their interfaces as a contiguous set of logical blocks; typically 512 bytes long but the industry is in the process of changing to 4,096 byte logical blocks; see Advanced Format. The process of initializing these logical blocks on the physical disk platters is called low level formatting which is usually performed at the factory and is not normally changed in the field. High level formatting then writes the file system structures into selected logical blocks to make the remaining logical blocks available to the host OS and its applications. The operating system file system uses some of the disk space to organize files on the disk, recording their file names and the sequence of disk areas that represent the file. Examples of data structures stored on disk to retrieve files include the MS DOS file allocation table (FAT), and UNIX inodes, as well as other operating system data structures. As a consequence not all the space on a hard drive is available for user files. This file system overhead is usually less than 1% on drives larger than 100 MB. In modern HDDs spare capacity for defect management is not included in the published capacity; however in many early HDDs a certain number of sectors were reserved for spares, thereby reducing capacity available to end users. For RAID drives, data integrity and fault-tolerance requirements also reduce the realized capacity. For example, a RAID1 drive will be about half the total capacity as a result of data mirroring. For RAID5 drives with x drives you would lose 1/x of your space to parity. RAID drives are multiple drives that appear to be one drive to the user, but provides some fault-tolerance. Most RAID vendors use some form of checksums to improve data integrity at the block level. For many vendors, this involves using HDDs with sectors of 520 bytes per sector to contain 512 bytes of user data and 8 checksum bytes or using separate 512 byte sectors for the checksum data. The gross capacity of older HDDs can be calculated by multiplying for each zone of the drive the number of cylinders by the number of heads by the number of sectors/zone by the number of bytes/sector (most commonly 512) and then summing the totals for all zones. Some modern ATA drives will also report cylinder, head, sector (C/H/S) values to the CPU but they are no longer actual physical parameters since the reported numbers are constrained by historic operating-system interfaces. Six hard drives with 8″, 5.25″, 3.5″, 2.5″, 1.8″, and 1″ hard disks with a ruler to show the length of platters and read-write heads. Mainframe and minicomputer hard disks were of widely varying dimensions, typically in free standing cabinets the size of washing machines (e.g. HP 7935 and DEC RP06 Disk Drives) or designed so that dimensions enabled placement in a 19" rack (e.g. Diablo Model 31). In 1962, IBM introduced its model 1311 disk, which used 14 inch (nominal size) platters. This became a standard size for mainframe and minicomputer drives for many years, but such large platters were never used with microprocessor-based systems. With increasing sales of microcomputers having built in floppy-disk drives (FDDs), HDDs that would fit to the FDD mountings became desirable, and this led to the evolution of the market towards drives with certain Form factors, initially derived from the sizes of 8-inch, 5.25-inch, and 3.5-inch floppy disk drives. Smaller sizes than 3.5 inches have emerged as popular in the marketplace and/or been decided by various industry groups. This smaller form factor, first used in an HDD by Seagate in 1980, was the same size as full-height 5+1⁄4-inch-diameter (130 mm) FDD, 3.25-inches high. This is twice as high as "half height"; i.e., 1.63 in (41.4 mm). Most desktop models of drives for optical 120 mm disks (DVD, CD) use the half height 5¼″ dimension, but it fell out of fashion for HDDs. The Quantum Bigfoot HDD was the last to use it in the late 1990s, with "low-profile" (≈25 mm) and "ultra-low-profile" (≈20 mm) high versions. This smaller form factor is similar to that used in an HDD by Rodime in 1983,, which was the same size as the "half height" 3½″ FDD, i.e., 1.63 inches high. Today, the 1-inch high ("slimline" or "low-profile") version of this form factor is the most popular form used in most desktops. This smaller form factor was introduced by PrairieTek in 1988; there is no corresponding FDD. It is widely used today for solid-state drives and for hard disk drives in mobile devices (laptops, music players, etc.) and as of 2008 replacing 3.5 inch enterprise-class drives. It is also used in the Playstation 3 and Xbox 360 video game consoles. Today, the dominant height of this form factor is 9.5 mm for laptop drives (usually having two platters inside), but higher capacity drives have a height of 12.5 mm (usually having three platters). Enterprise-class drives can have a height up to 15 mm. Seagate released a 7mm drive aimed at entry level laptops and high end netbooks in December 2009. This form factor, originally introduced by Integral Peripherals in 1993, has evolved into the ATA-7 LIF with dimensions as stated. It was increasingly used in digital audio players and subnotebooks, but is rarely used today. An original variant exists for 2–5GB sized HDDs that fit directly into a PC card expansion slot. These became popular for their use in iPods and other HDD based MP3 players. Toshiba announced this form factor in January 2004 for use in mobile phones and similar applications, including SD/MMC slot compatible HDDs optimized for video storage on 4G handsets. Toshiba currently sells a 4 GB (MK4001MTD) and 8 GB (MK8003MTD) version [dead link] and holds the Guinness World Record for the smallest hard disk drive. 3.5-inch and 2.5-inch hard disks currently dominate the market. By 2009 all manufacturers had discontinued the development of new products for the 1.3-inch, 1-inch and 0.85-inch form factors due to falling prices of flash memory, which is slightly more stable and resistant to damage from impact and/or dropping. The factors that limit the time to access the data on a hard disk drive (Access time) are mostly related to the mechanical nature of the rotating disks and moving heads. Seek time is a measure of how long it takes the head assembly to travel to the track of the disk that contains data. Rotational latency is incurred because the desired disk sector may not be directly under the head when data transfer is requested. These two delays are on the order of milliseconds each. The bit rate or data transfer rate once the head is in the right position creates delay which is a function of the number of blocks transferred; typically relatively small, but can be quite long with the transfer of large contiguous files. Delay may also occur if the drive disks are stopped to save energy, see Power management. Defragmentation is a procedure used to minimize delay in retrieving data by moving related items to physically proximate areas on the disk. Some computer operating systems perform defragmentation automatically. Although automatic defragmentation is intended to reduce access delays, the procedure can slow response when performed while the computer is in use. Access time can be improved by increasing rotational speed, thus reducing latency and/or by decreasing seek time. Increasing areal density increases throughput by increasing data rate and by increasing the amount of data under a set of heads, thereby potentially reducing seek activity for a given amount of data. Based on historic trends, analysts predict a future growth in HDD areal density (and therefore capacity) of about 40% per year. Access times have not kept up with throughput increases, which themselves have not kept up with growth in storage capacity. Low-level formatting software to find highest performance interleave choice for 10 MB IBM PC XT hard disk drive. 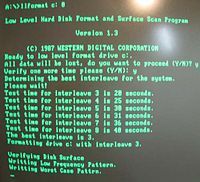 Sector interleave is a mostly obsolete device characteristic related to access time, dating back to when computers were too slow to be able to read large continuous streams of data. Interleaving introduced gaps between data sectors to allow time for slow equipment to get ready to read the next block of data. Without interleaving, the next logical sector would arrive at the read/write head before the equipment was ready, requiring the system to wait for another complete disk revolution before reading could be performed. However, because interleaving introduces intentional physical delays into the drive mechanism, setting the interleave to a ratio higher than required causes unnecessary delays for equipment that has the performance needed to read sectors more quickly. The interleaving ratio was therefore usually chosen by the end-user to suit their particular computer system's performance capabilities when the drive was first installed in their system. Modern technology is capable of reading data as fast as it can be obtained from the spinning platters, so hard drives usually have a fixed sector interleave ratio of 1:1, which is effectively no interleaving being used. Average seek time ranges from 3 ms for high-end server drives, to 15 ms for mobile drives, with the most common mobile drives at about 12 ms and the most common desktop type typically being around 9 ms. The first HDD had an average seek time of about 600 ms and by the middle 1970s HDDs were available with seek times of about 25 ms. Some early PC drives used a stepper motor to move the heads, and as a result had seek times as slow as 80–120 ms, but this was quickly improved by voice coil type actuation in the 1980s, reducing seek times to around 20 ms. Seek time has continued to improve slowly over time. Some desktop and laptop computer systems allow the user to make a tradeoff between seek performance and drive noise. Faster seek rates typically require more energy usage to quickly move the heads across the platter, causing loud noises from the pivot bearing and greater device vibrations as the heads are rapidly accelerated during the start of the seek motion and decelerated at the end of the seek motion. Quiet operation reduces movement speed and acceleration rates, but at a cost of reduced seek performance. Latency is the delay for the rotation of the disk to bring the required disk sector under the read-write mechanism. It depends on rotational speed of a disk, measured in revolutions per minute (rpm). 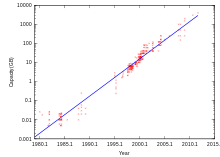 Average rotational latency is shown in the table below, based on the empirical relation that the average latency in milliseconds for such a drive is one-half the rotational period. As of 2010, a typical 7200 rpm desktop hard drive has a sustained "disk-to-buffer" data transfer rate up to 1030 Mbits/sec. This rate depends on the track location, so it will be higher for data on the outer tracks (where there are more data sectors) and lower toward the inner tracks (where there are fewer data sectors); and is generally somewhat higher for 10,000 rpm drives. A current widely used standard for the "buffer-to-computer" interface is 3.0 Gbit/s SATA, which can send about 300 megabyte/s (10 bit encoding) from the buffer to the computer, and thus is still comfortably ahead of today's disk-to-buffer transfer rates. Data transfer rate (read/write) can be measured by writing a large file to disk using special file generator tools, then reading back the file. Transfer rate can be influenced by file system fragmentation and the layout of the files. HDD data transfer rate depends upon the rotational speed of the platters and the data recording density. Because heat and vibration limit rotational speed, advancing density becomes the main method to improve sequential transfer rates. While areal density advances by increasing both the number of tracks across the disk and the number of sectors per track, only the latter will increase the data transfer rate for a given rpm. Since data transfer rate performance only tracks one of the two components of areal density, its performance improves at a lower rate. Power consumption has become increasingly important, not only in mobile devices such as laptops but also in server and desktop markets. Increasing data center machine density has led to problems delivering sufficient power to devices (especially for spin up), and getting rid of the waste heat subsequently produced, as well as environmental and electrical cost concerns (see green computing). Heat dissipation is tied directly to power consumption, and as drives age, disk failure rates increase at higher drive temperatures. Similar issues exist for large companies with thousands of desktop PCs. Smaller form factor drives often use less power than larger drives. One interesting development in this area is actively controlling the seek speed so that the head arrives at its destination only just in time to read the sector, rather than arriving as quickly as possible and then having to wait for the sector to come around (i.e. the rotational latency). Many of the hard drive companies are now producing Green Drives that require much less power and cooling. Many of these Green Drives spin slower (<5400 rpm compared to 7200, 10,000 or 15,000 rpm) thereby generating less heat. Power consumption can also be reduced by parking the drive heads when the disk is not in use reducing friction, adjusting spin speeds, and disabling internal components when not in use. Also in systems where there might be multiple hard disk drives, there are various ways of controlling when the hard drives spin up since the highest current is drawn at that time. On Parallel ATA (PATA) and Serial ATA (SATA) hard disk drives, some support power-up in standby or PUIS. The hard disk drive will not spin up until the controller or system BIOS issues a specific command to do so. This limits the power draw or consumption upon power on. 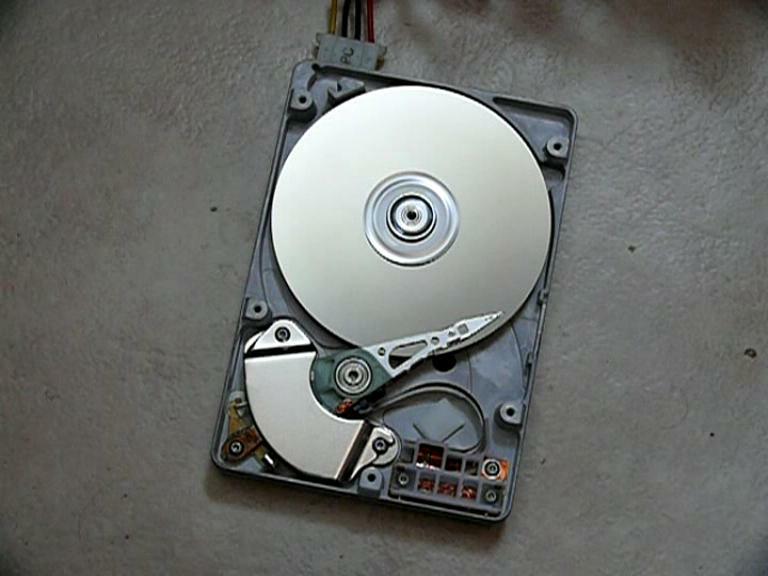 Some SATA II hard disk drives support Spin-up#Staggered_spin-up, allowing the computer to spin up the drives in sequence to reduce load on the power supply when booting. Most hard disk drives today support some form of power management which uses a number of specific power modes that save energy by reducing performance. When implemented an HDD will change between a full power mode to one or more power saving modes as a function of drive usage. Recovery from the deepest mode, typically called Sleep, may take as long as several seconds. Measured in dBA, audible noise is significant for certain applications, such as DVRs, digital audio recording and quiet computers. Low noise disks typically use fluid bearings, slower rotational speeds (usually 5400 rpm) and reduce the seek speed under load (AAM) to reduce audible clicks and crunching sounds. Drives in smaller form factors (e.g. 2.5 inch) are often quieter than larger drives. Shock resistance is especially important for mobile devices. Some laptops now include active hard drive protection that parks the disk heads if the machine is dropped, hopefully before impact, to offer the greatest possible chance of survival in such an event. Maximum shock tolerance to date is 350 g for operating and 1000 g for non-operating. Hard disk drives are accessed over one of a number of bus types, including parallel ATA (PATA, also called IDE or EIDE), Serial ATA (SATA), SCSI, Serial Attached SCSI (SAS), and Fibre Channel. Bridge circuitry is sometimes used to connect hard disk drives to buses with which they cannot communicate natively, such as IEEE 1394, USB and SCSI. Many ST-506 interface disk drives were only specified by the manufacturer to run at the 1/3 lower MFM data transfer rate compared to RLL, while other drive models (usually more expensive versions of the same drive) were specified to run at the higher RLL data transfer rate. In some cases, a drive had sufficient margin to allow the MFM specified model to run at the denser/faster RLL data transfer rate (not recommended nor guaranteed by manufacturers). Also, any RLL-certified drive could run on any MFM controller, but with 1/3 less data capacity and as much as 1/3 less data transfer rate compared to its RLL specifications. Enhanced Small Disk Interface (ESDI) also supported multiple data rates (ESDI disks always used 2,7 RLL, but at 10, 15 or 20 megabits per second), but this was usually negotiated automatically by the disk drive and controller; most of the time, however, 15 or 20 megabit ESDI disk drives were not downward compatible (i.e. a 15 or 20 megabit disk drive would not run on a 10 megabit controller). ESDI disk drives typically also had jumpers to set the number of sectors per track and (in some cases) sector size. ATA disks have typically had no problems with interleave or data rate, due to their controller design, but many early models were incompatible with each other and could not run with two devices on the same physical cable in a master/slave setup. This was mostly remedied by the mid-1990s, when ATA's specification was standardized and the details began to be cleaned up, but still causes problems occasionally (especially with CD-ROM and DVD-ROM disks, and when mixing Ultra DMA and non-UDMA devices). FireWire/IEEE 1394 and USB(1.0/2.0/3.0) hard drives consist of enclosures containing generally ATA or Serial ATA disks with built-in adapters to these external buses. Historical bit serial interfaces connect a hard disk drive (HDD) to a hard disk controller (HDC) with two cables, one for control and one for data. (Each drive also has an additional cable for power, usually connecting it directly to the power supply unit). The HDC provided significant functions such as serial/parallel conversion, data separation, and track formatting, and required matching to the drive (after formatting) in order to assure reliability. Each control cable could serve two or more drives, while a dedicated (and smaller) data cable served each drive. Enhanced Small Disk Interface (ESDI) was an industry standard interface similar to ST412 supporting higher data rates between the processor and the disk drive. Serial Attached SCSI (SAS). The SAS is a new generation serial communication protocol for devices designed to allow for much higher speed data transfers and is compatible with SATA. SAS uses a mechanically identical data and power connector to standard 3.5-inch SATA1/SATA2 HDDs, and many server-oriented SAS RAID controllers are also capable of addressing SATA hard drives. SAS uses serial communication instead of the parallel method found in traditional SCSI devices but still uses SCSI commands. Word serial interfaces connect a hard disk drive to a host bus adapter (today typically integrated into the "south bridge") with one cable for combined data/control. (As for all bit serial interfaces above, each drive also has an additional power cable, usually direct to the power supply unit.) The earliest versions of these interfaces typically had a 8 bit parallel data transfer to/from the drive, but 16-bit versions became much more common, and there are 32 bit versions. Modern variants have serial data transfer. The word nature of data transfer makes the design of a host bus adapter significantly simpler than that of the precursor HDD controller. Integrated Drive Electronics (IDE), later renamed to ATA, with the alias P-ATA or PATA ("parallel ATA") retroactively added upon introduction of the new variant Serial ATA. The original name reflected the innovative integration of HDD controller with HDD itself, which was not found in earlier disks. Moving the HDD controller from the interface card to the disk drive helped to standardize interfaces, and to reduce the cost and complexity. The 40-pin IDE/ATA connection transfers 16 bits of data at a time on the data cable. The data cable was originally 40-conductor, but later higher speed requirements for data transfer to and from the hard drive led to an "ultra DMA" mode, known as UDMA. Progressively swifter versions of this standard ultimately added the requirement for a 80-conductor variant of the same cable, where half of the conductors provides grounding necessary for enhanced high-speed signal quality by reducing cross talk. 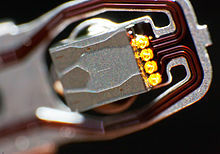 The interface for 80-conductor only has 39 pins, the missing pin acting as a key to prevent incorrect insertion of the connector to an incompatible socket, a common cause of disk and controller damage. ATA (PATA) Advanced Technology Attachment Successor to ST-412/506/ESDI by integrating the disk controller completely onto the device. Incapable of concurrent operations. Due to the extremely close spacing between the heads and the disk surface, hard disk drives are vulnerable to being damaged by a head crash—a failure of the disk in which the head scrapes across the platter surface, often grinding away the thin magnetic film and causing data loss. Head crashes can be caused by electronic failure, a sudden power failure, physical shock, contamination of the drive's internal enclosure, wear and tear, corrosion, or poorly manufactured platters and heads. The HDD's spindle system relies on air pressure inside the disk enclosure to support the heads at their proper flying height while the disk rotates. Hard disk drives require a certain range of air pressures in order to operate properly. The connection to the external environment and pressure occurs through a small hole in the enclosure (about 0.5 mm in breadth), usually with a filter on the inside (the breather filter). If the air pressure is too low, then there is not enough lift for the flying head, so the head gets too close to the disk, and there is a risk of head crashes and data loss. Specially manufactured sealed and pressurized disks are needed for reliable high-altitude operation, above about 3,000 m (10,000 feet). Modern disks include temperature sensors and adjust their operation to the operating environment. Breather holes can be seen on all disk drives—they usually have a sticker next to them, warning the user not to cover the holes. The air inside the operating drive is constantly moving too, being swept in motion by friction with the spinning platters. This air passes through an internal recirculation (or "recirc") filter to remove any leftover contaminants from manufacture, any particles or chemicals that may have somehow entered the enclosure, and any particles or outgassing generated internally in normal operation. Very high humidity for extended periods can corrode the heads and platters. During normal operation heads in HDDs fly above the data recorded on the disks. 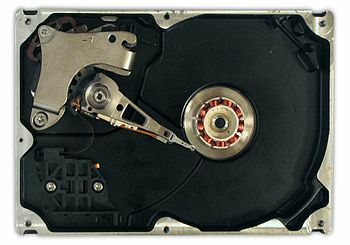 Modern HDDs prevent power interruptions or other malfunctions from landing its heads in the data zone by either physically moving (parking) the heads to a special landing zone on the platters that is not used for data storage, or by physically locking the heads in a suspended (unloaded) position raised off the platters. Some early PC HDDs did not park the heads automatically when power was prematurely disconnected and the heads would land on data. In some other early units the user manually parked the heads by running a program to park the HDD's heads. Around 1995 IBM pioneered a technology where a landing zone on the disk is made by a precision laser process (Laser Zone Texture = LZT) producing an array of smooth nanometer-scale "bumps" in a landing zone, thus vastly improving stiction and wear performance. This technology is still largely in use today (2011), predominantly in desktop and enterprise (3.5 inch) drives. In general, CSS technology can be prone to increased stiction (the tendency for the heads to stick to the platter surface), e.g. as a consequence of increased humidity. Excessive stiction can cause physical damage to the platter and slider or spindle motor. 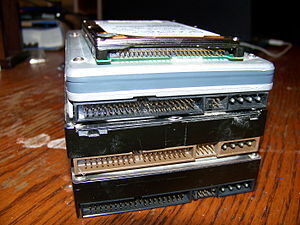 SCSI, SAS, and FC drives are typically more expensive and are traditionally used in servers and disk arrays, whereas inexpensive ATA and SATA drives evolved in the home computer market and were perceived to be less reliable. This distinction is now becoming blurred. The mean time between failures (MTBF) of SATA drives is usually about 600,000 hours (some drives such as Western Digital Raptor have rated 1.4 million hours MTBF), while SCSI drives are rated for upwards of 1.5 million hours. However, independent research indicates that MTBF is not a reliable estimate of a drive's longevity. MTBF is conducted in laboratory environments in test chambers and is an important metric to determine the quality of a disk drive before it enters high volume production. Once the drive product is in production, the more valid metric is annualized failure rate (AFR). AFR is the percentage of real-world drive failures after shipping. Typically enterprise drives (all enterprise drives, including SCSI, SAS, enterprise SATA, and FC) experience between 0.70%–0.78% annual failure rates from the total installed drives. Eventually all mechanical hard disk drives fail, so to mitigate loss of data, some form of redundancy is needed, such as RAID or a regular backup system. External removable hard disk drives offer independence from system integration, establishing communication via connectivity options, such as USB. Plug and play drive functionality offers system compatibility, and features large volume data storage options, but maintains a portable design. External hard disk drives are available in two main sizes (physical size), 2.5" and 3.5". Features such as biometric security or multiple interfaces are available at a higher cost. As of September 2011[update], the highest capacity consumer HDDs is 4 TB. The fastest enterprise HDDs spin at 10,000 or 15,000 rpm, and can achieve sequential media transfer speeds above 1.6 Gbit/s. and a sustained transfer rate up to 1 Gbit/s. Drives running at 10,000 or 15,000 rpm use smaller platters to mitigate increased power requirements (as they have less air drag) and therefore generally have lower capacity than the highest capacity desktop drives. Enterprise drives commonly operate continuously ("24/7") in demanding environments while delivering the highest possible performance without sacrificing reliability. Maximum capacity is not the primary goal, and as a result the drives are often offered in capacities that are relatively low in relation to their cost. Mobile HDDs or laptop HDDs, smaller than their desktop and enterprise counterparts, tend to be slower and have lower capacity. A typical mobile HDD spins at either 4200 rpm, 5200 rpm, 5400 rpm, or 7200 rpm, with 5400 rpm being the most prominent. 7200 rpm drives tend to be more expensive and have smaller capacities, while 4200 rpm models usually have very high storage capacities. Because of smaller platter(s), mobile HDDs generally have lower capacity than their greater desktop counterparts. The exponential increases in disk space and data access speeds of HDDs have enabled the commercial viability of consumer products that require large storage capacities, such as digital video recorders and digital audio players. In addition, the availability of vast amounts of cheap storage has made viable a variety of web-based services with extraordinary capacity requirements, such as free-of-charge web search, web archiving, and video sharing (Google, Internet Archive, YouTube, etc.). Worldwide revenue from shipments of HDDs is expected to reach $27.7 billion in 2010, up 18.4% from $23.4 billion in 2009 corresponding to a 2010 unit shipment forecast of 674.6 million compared to 549.5 million units in 2009. HDDs are traditionally symbolized as a stylized stack of platters or as a cylinder and are found in diagrams or on lights to indicate hard drive access. 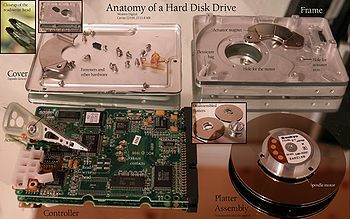 In most modern operating systems, hard drives are represented by an illustration or photograph of the drive enclosure, as shown in the examples below. Mueller, Scott (2011). Upgrading and Repairing PCs (20th ed.). Que. ISBN 0789747103. Messmer, Hans-Peter (2001). The Indispensable PC Hardware Book (4th ed.). Addison-Wesley. ISBN 0201596164. ^ This is the original filing date of the application which led to US Patent 3,503,060, generally accepted as the definitive disk drive patent; see, Kean, David W., "IBM San Jose, A quarter century of innovation", 1977. ^ Further terms used to describe hard disk drives include disk drive, disk file, direct access storage device (DASD), fixed disk, CKD disk, and Winchester Disk Drive (after the IBM 3340). The term DASD includes other devices besides disks. ^ "IBM 350 disk storage unit". IBM. http://www-03.ibm.com/ibm/history/exhibits/storage/storage_350.html. Retrieved 24 June 2010. ^ Scotia, Nova. "Cost of Hard Drive storage Space". http://ns1758.ca/winch/winchest.html. Retrieved 12 March 2011. ^ In storage engineering, the term spindle also refers to a single drive that can only handle one or a limited number of I/O operations making it a point of focus in scheduling operations to an array of drives. ^ "Hard Drives". escotal.com. http://www.escotal.com/harddrive.html. Retrieved 2011-07-16. ^ "What is a "head-crash" & how can it result in permanent loss of my hard drive data?". data-master.com. http://www.data-master.com/HeadCrash-explain-hard-disk-drive-fail_Q18.html. Retrieved 2011-07-16. ^ "Hard Drive Help". hardrivehelp.com. http://www.hard-drive-help.com/technology.html. Retrieved 2011-07-16. ^ Elert, Glenn. "Thickness of a Piece of Paper". HyperTextbook.com. http://hypertextbook.com/facts/2001/JuliaSherlis.shtml. Retrieved 2011-07-09. ^ Blount, Walker C. (November 2007). "Why 7200 RPM Mobile Hard Disk Drives?". http://www.hitachigst.com/tech/techlib.nsf/techdocs/33c6a76df9338b0a86256d34007054c0/%24file/why7200mobilehdds.pdf. Retrieved 2011-07-17. The source states 3600 RPM drives were available in the past, but as of November 2007, 4200 was the lowest available from Hitachi. ^ Kanellos, Michael (24 August 2006). "A divide over the future of hard drives". CNETNews.com. http://www.zdnetasia.com/a-divide-over-the-future-of-hard-drives-39393818.htm. Retrieved 24 June 2010. ^ "IBM OEM MR Head | Technology | The era of giant magnetoresistive heads". Hitachigst.com. 27 August 2001. https://www1.hitachigst.com/hdd/technolo/gmr/gmr.htm. Retrieved 4 September 2010. ^ "Press Releases December 14, 2004". Toshiba. http://www.toshiba.co.jp/about/press/2004_12/pr1401.htm. Retrieved 13 March 2009. ^ "Seagate Momentus 2½" HDDs per webpage Jan 2008". Seagate.com. 24 October 2008. http://www.seagate.com/www/en-us/products/laptops/momentus/. Retrieved 13 March 2009. ^ "Seagate Barracuda 3½" HDDs per webpage January 2008". Seagate.com. 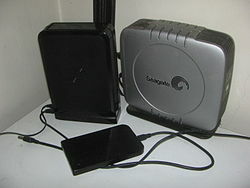 http://www.seagate.com/www/en-us/products/desktops/barracuda_hard_drives/. Retrieved 13 March 2009. ^ "Western Digital Scorpio 2½" and Greenpower 3½" HDDs per quarterly conference, July 2007". Wdc.com. http://www.wdc.com/en/company/investor/q108remarks.asp. Retrieved 13 March 2009. ^ "Will Toshiba's Bit-Patterned Drives Change the HDD Landscape?". PC Magazine. 19 August 2010. http://www.pcmag.com/article2/0,2817,2368023,00.asp. Retrieved 21 August 2010. ^ "Xyratex no-go for bit-patterned media". The Register. 24 April 2010. http://www.theregister.co.uk/2010/05/24/xyratex_hamr/. Retrieved 21 August 2010. ^ "Report: TDK Technology “More Than Doubles” Capacity Of HDDs". http://techcrunch.com/2011/10/04/report-tdk-technology-more-than-doubles-capacity-of-hdds/?utm_source=feedburner&utm_medium=feed&utm_campaign=Feed%3A+Techcrunch+%28TechCrunch%29. Retrieved October 4, 2011. ^ "650 RAMAC announcement". http://www-03.ibm.com/ibm/history/exhibits/650/650_pr2.html. IBM Press Release, 13 September 1956, announcing the IBM 305 RAMAC. The first disk drive invented by IBM in 1956 was described by IBM using the descriptive noun million, as in "... a built-in 5-million-digit disk memory"
^ Introduction to IBM Direct Access Storage Devices, M. Bohl, IBM publication SR20-4738 ©1981. ^ G. M. Amdahl et. al. (1964). "Architecture of the IBM System/360". IBM JRD 8 (2). "Capacity 8 bit Bytes – 1K = 1024"
^ PDP11/05/10/30/40 Processor Handbook, Digital Equipment Corp., 1973, p. 1-1, http://www.bitsavers.org/pdf/dec/pdp11/handbooks/PDP1105-40_Handbook_1973.pdf, "... direct addressing of 32K 16-bit words or 64K 8-bit bytes (K = 1024)" This document contains approximately 80 instances of K meaning 1024. ^ Topher Kessler. "Snow Leopard changes how file and drive sizes are calculated". cnet Reviews. http://reviews.cnet.com/8301-13727_7-10330509-263.html. "Altering this convention to agree with English could have been done at any time; however, for some reason it just stuck this way for a lot of the computing industry". ^ National Institute of Standards and Technology. "Prefixes for binary multiples". http://physics.nist.gov/cuu/Units/binary.html. "In December 1998 the International Electrotechnical Commission (IEC) [...] approved as an IEC International Standard names and symbols for prefixes for binary multiples for use in the fields of data processing and data transmission." ^ See: Low-Level Formatting. However, some enterprise SAS drives (e.g. Seagate Constellation ES) have other block sizes such as 520, 524 and 528 bytes which can be changed in the field. ^ Christensen, Clayton M. (1997). The Innovator's Dilemma. New York, New York: HarperBusiness. p. 19. ISBN 0-06-662069-4. ^ "Winchester has 3.5-inch diameter". Electronics: 184. March 1983. ^ Chandler, Doug (26 September 1988). "Startup Ships 2.5-Inch Hard Disk Aimed for Portables, Laptops". PC Week: 6. ^ schmid, Patrick and Achim Roos (8 May 2010). "3.5" Vs. 2.5" SAS HDDs: In Storage, Size Matters". Tomshardware.com. http://www.tomshardware.co.uk/enterprise-storage-sas-hdd,review-31891.html. Retrieved 25 June 2010. ^ "Playstation 3 Slim Teardown". 25 August 2009. http://www.ifixit.com/Teardown/PlayStation-3-Slim/1121/1. Retrieved 15 November 2010. ^ Schmid, Patrick and Achim Roos (22 May 2010). "9.5 Versus 12.5 mm: Which Notebook HDD Is Right For You?". Tomshardware.com. http://www.tomshardware.com/reviews/2.5-inch-12.5-mm-9.5-mm,2623.html. Retrieved 22 June 2010. ^ "Seagate Unveils World's Thinnest 2.5-Inch Hard Drive For Slim Laptop Computers". physorg.com. 15 December 2009. http://www.physorg.com/news180118264.html. Retrieved 15 December 2009. ^ Flash price fall shakes HDD market, EETimes Asia, 1 August 2007. ^ a b Branded external only. ^ a b "Seagate’s 4TB GoFlex Breaks the Hard Drive Capacity Ceiling". 2011-09-07. http://techjost.com/seagate%e2%80%99s-4tb-goflex-breaks-the-hard-drive-capacity-ceiling/. Retrieved 2011-09-07. ^ 750 GB for IDE-based barebone, 3 TB for SATA-based barebone. ^ Proving that 2.5 inch hard disk drive with height of 7 mm exists. ^ 750 GB, 1 TB, or 1.5 TB only. ^ 320 GB for IDE-based barebone, 1 TB for SATA-based barebone. ^ "Toshiba Storage Solutions – MK3233GSG". http://www.toshiba.co.jp/about/press/2009_11/pr0501.htm. ^ "SDK Starts Shipments of 1.3-Inch PMR-Technology-Based HD Media". Sdk.co.jp. 10 January 2008. http://www.sdk.co.jp/aa/english/news/2008/aanw_08_0812.html. Retrieved 13 March 2009. ^ Proving that 8 GB, 0.85 inch hard disk drive exists. ^ Toshiba Enters Guinness World Records Book with the World's Smallest Hard Disk Drive. ^ a b Kearns, Dave (18 April 2001). "How to defrag". ITWorld. http://www.itworld.com/NWW01041100636262. ^ Broida, Rick (10 April 2009). "Turning Off Disk Defragmenter May Solve a Sluggish PC". PCWorld. http://www.pcworld.com/article/162955/turning_off_disk_defragmenter_may_solve_a_sluggish_pc.html. ^ "WD VelicoRaptor: Drive Specifications". Western Digital. June 2010. http://www.wdc.com/en/products/products.aspx?id=20. Retrieved 15 January 2011. ^ "WD Scorpio Blue Mobile: Drive Specifications". Western Digital. June 2010. http://www.wdc.com/en/products/products.aspx?id=140. Retrieved 15 January 2011. ^ "Speed Considerations", Seagate website. Retrieved 22 January 2011. ^ Artamonov, Oleg (6 December 2007). "Hard Disk Drive Power Consumption Measurements: X-bit’s Methodology". Xbit Laboratories. http://www.xbitlabs.com/articles/storage/display/hdd-power-cons.html. ^ Hitachi Unveils Energy-Efficient Hard Drive with Variable Spindle Speed. ^ Webber, Lawrence; Wallace, Michael (2009). Green tech: how to plan and implement sustainable IT solutions. p. 62. ISBN 081441446X. http://books.google.com/books?id=BKTALNq5ceAC&lpg=PA62&dq=green%20disk%20drive&pg=PA62#v=onepage&q=green%20disk%20drive&f=false. ^ Trusted Reviews (31 August 2005). "Hitachi Deskstar 7K500 500GB HDD: As fast as it's big?". http://www.theregister.co.uk/2005/08/31/review_hitachi_7k500/. ^ "Reed Solomon Codes – Introduction"
^ IEEE.org, Baumgart, P.; Krajnovich, D.J. ; Nguyen, T.A. ; Tam, A.G.; IEEE Trans. Magn. ^ "Sony | For Business | VAIO SMB". B2b.sony.com. http://b2b.sony.com/Solutions/lpage.do?page=/vaio_smb/index.html&name=VAIO%20SMB. Retrieved 13 March 2009. ^ a b c d Eduardo Pinheiro, Wolf-Dietrich Weber and Luiz André Barroso (February 2007). "Failure Trends in a Large Disk Drive Population". USENIX Conference on File and Storage Technologies. 5th USENIX Conference on File and Storage Technologies (FAST 2007). http://labs.google.com/papers/disk_failures.html. Retrieved 15 September 2008. ^ "Everything You Know About Disks Is Wrong". StorageMojo. 20 February 2007. http://storagemojo.com/?p=383. Retrieved 29 August 2007. ^ "Differences between an Enterprise-Class HDD and a Desktop-Class HDD". Synology.com. 4 September 2008. http://www.synology.com/wiki/index.php/Differences_between_an_Enterprise-Class_HDD_and_a_Desktop-Class_HDD. Retrieved 13 March 2009. ^ a b As discussed in their articles neither RAID nor backup are fool proof. ^ Walter, Chip (25 July 2005). "Kryder's Law". Scientific American (Verlagsgruppe Georg von Holtzbrinck GmbH). http://www.sciam.com/article.cfm?articleID=000B0C22-0805-12D8-BDFD83414B7F0000&ref=sciam&chanID=sa006. Retrieved 29 October 2006. ^ "Storage New Roundup: Q4'2010 Hard drive Market Analysis". 11 February 2011. http://www.servethehome.com/storage-news-roundup-q42010-hard-drive-market-analysis/. Retrieved 2011-07-24. This page was last modified on 24 November 2011 at 03:06.